Over many decades, Israel’s self-serving deceptions about the Nakba in 1948 have been exposed for the lies Palestinians already knew them to be. It was long accepted in the west that, as Israel claimed, Palestinians left their homes because they had been ordered to do so by neighbouring Arab leaders. The lie usefully distracted diplomats and scholars from the much more pertinent question of why Israel had refused to allow 750,000 Palestinian refugees to return to their homes after the war finished, as international law demanded. The myth about the Arab leaders’ order, which had been steadily undermined by the work of the “new historians” of the late 1980s, was decisively punctured two years ago by an Israeli scholar who was given the wrong file by Israeli army archivists. It showed the story of the Arab leaders’ order was concocted by Israeli officials. The same files should also have ended an equally diverting and lengthy debate about how many Palestinian villages Israel ethnically cleansed in 1948. Most Palestinian scholars were agreed it was well over 500; Israeli experts variously claimed it was between 300 and 400. Not that hundreds of ethnically cleansed villages was not bad enough, but Israel was happy to engage in a debate designed to make Palestinians look like inveterate exaggerators. Again, Israel’s archives confirmed the Palestinian account, with 530 villages razed. Now another, related deception has been exposed. For decades Israel’s supporters have been arguing that Haifa, one of Palestine’s most important cities, was not ethnically cleansed of its population. The tens of thousands of Palestinians who fled under Israeli attack in April 1948 were later urged to return, according to Israel’s supporters, but they chose not to. Further proof, it seemed, that the Palestinians had only themselves to blame for losing their homeland. They chose to stay away. Strangely, none of Israel’s propagandists ever seriously tried to suggest that the other 700,00 or so Palestinian refugees had been invited back home. It seemed as if the welcome supposedly extended in Haifa was reason enough for all Palestinians in exile to put aside their fears of Israel’s shoot-to-kill policy at its new borders and make the journey home. 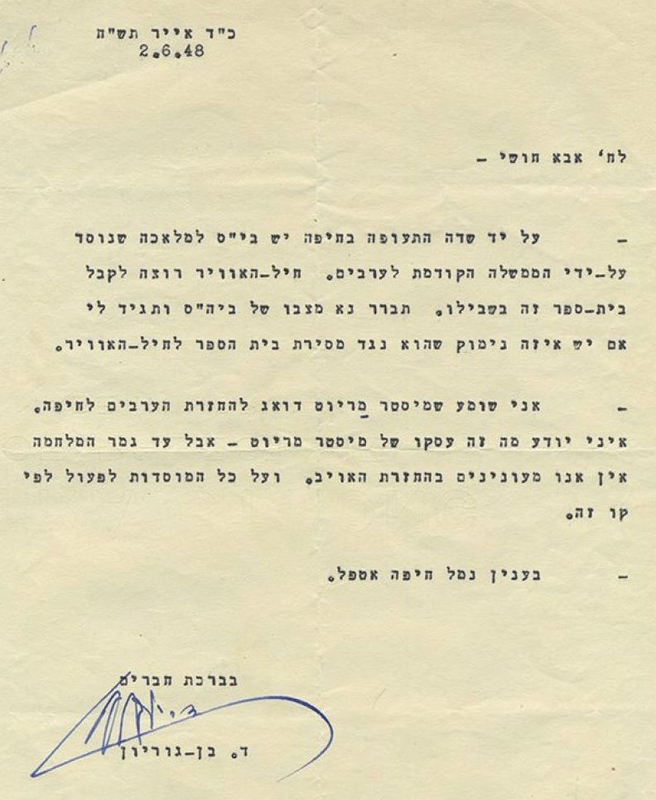 But now a letter signed by David Ben Gurion, Israel’s first prime minister and the engineer of its ethnic cleansing policy in 1948, shows that, far from Haifa’s doors being thrown open, Ben Gurion ordered that the refugees be barred from returning. 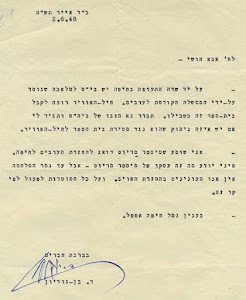 Of course, that policy was not reversed after the war, as Ben Gurion hinted it might be. And one can wonder how much more specific his orders were to his army commanders if this was what he was telling civilian administrators. Heartbreaking – if only it were true.